Our annual art party and benefit is on April 18th was a great success! This year our proceeds benefited the Residence Association of Greater Englewood. Once again it was be a great party! I was honored to be a part of the fabulous em.body.peace art event on Valentine's day. This fun and fabulous art party raised funds for the 47th Ward Mural Initiative. It was a huge success! 8 artists were featured, including me, and about 200 people attended the event! The night was filled with great art, great food, yummy cocktails and lots of dancing and a cool performance piece. The series of paintings I exhibited, The Flower Girls, were very well received. I designed the branding and collateral for the event as well as collaborated with fellow artist, Julie Hobert, to create animated titles for her performance piece, Full Public Disclosure. Click through the paintings I created here. Please contact me if you would like to buy any originals or digital fine art prints of the work you see. The Drawing Workshop has been saved! The Drawing Workshop will continue under Lillstreet after August! The efforts of a great group of artists dedicated to keeping the tradition of figure drawing and painting in an atelier style learning environment have succeeded. Lill Street will continue to run the Drawing Workshop with the same approach that was founded by George Santos 40 years ago at the same location at 4011 N. Ravenswood in Chicago. The Em.body.Peace Art show at Lill Street Studio was a great success! Thank you to everyone who came and supported our cause. It was a wonderful evening! Come to our Art Show and Benefit on Valentine's Day! The proceeds benefit the Center for Advancing Domestic Peace, Inc. It will be a night of figurative art: drawing, painting, photography and live performance. Spacca Napoli is donating yummy appetizers and the beverages will be plentiful. 5$ suggested donation * 21 and over as there will be unclothed models in the performance. I will be donating some of my watercolor figure and portrait pieces as well as creating animated titles for Julie Hobert's performance piece. This commercial for Toyota was created by Brand New School. The slogan of the spot is “THE CAR THAT READS THE ROAD.” Brand New School created custom typography as three dimensional elements that the car passes on its journey. This is an excellent twist on non-font typography because the idea is that each word is inherently designed into objects, yet the objects are created digitally with 3-D generated type or other generated elements. 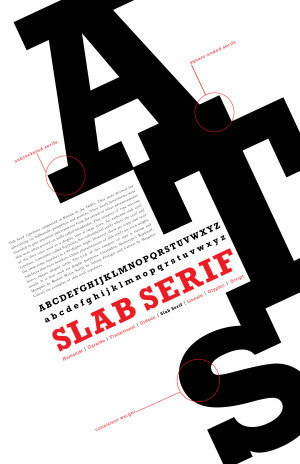 Each typeface is designed with proper typographic anatomy and is specific to each object that it is depicting. These are 3 still frames from the spot. In the first frame, one can see a distinct sans serif typeface built out of bricks. The weight, proportion, and tracking serve to carry the weight of the bridge. Notice the non-font representation of the word “Birds” in the sky. The second frames show a car made out of a typeface reminiscent of the 1970’s with its chrome edging and italic sans serif classification. city is made of type. Brand New School says of their process,”..we ended up designing just one custom-made alphabet for all the cars, but made all sorts of letter-like shapes for everything else.” I am classifying this as a “good” example because of it’s refreshing use of custom designed typography to support a message. The second still shows a lack of attention to kerning, tracking, line length and alignment. The web site address is tracked so closely that the letters touch making it hard to read. It is better to reduce the point size to fit the area or choose another typeface. Certain letter pairs have considerably more space between them then others like the v,i and a,n. This means that the kerning needs to be adjusted. Dividing the web site address into three lines does not read well. The phone numbers have no hyphens and are justified which looks odd with the centered alignment of the web site. There is no typographic hierarchy, so the viewer is not sure which piece of information is more important. On both stills, the stroke and outline of the type alters the counters of the letters in a way that fills them in. There are 3 frames from the credit sequence for the film, A Series of Unfortunate Events, created by Jamie Calieri. Effective typographic techniques are used to set the tone of the film. The film is about disasters that befall a family of orphans and is set in a nonspecific time yet has elements of the Victorian age, mixed with current times. There is an eccentric, odd tone to the movie. The art direction emphasizes the somber tones and fabric patterns of the Victorian age in its costumes, set design and overall color palette. This is an example of good typography for the following reasons. The typeface choices reflect this mixture of Victorian and current aesthetics. In the first and second frames the job position line is set in a sans serif all capital letter typeface that is modern in feel. Contrasting this are the credit names which are set in serif type which suggests traditional formality. To further the contrast, the names have initial capitals that are set in a non-italic serif family member thus giving an unconventional quality to the type that is in keeping with tone of the film. The loose tracking of the names and the larger point size as compared to the sans serif job titles create typographical hierarchy. The alignment is purposely indented to create a feeling of movement and oddity. The end title uses the same type techniques as the credits but is enhanced by scrolling flourishes which are also reminiscent of Victorian design. The title seems very formal yet the Lemony Snicket name is set in a sans serif all caps typeface that is contemporary and ties in with the credits. The placement of all these elements work within the composition of each frame. The text becomes an integral element in the overall layout of the paper cutout artwork of each scene. Calieri says of this piece, “I wanted to make an enchanting, inviting piece that not only held true to the sentiment of the Lemony Snicket books, but also paid tribute to the amazing talent listed in the end credits." This effective use of type is one component of the overall piece that helped him achieve his goal. So many students (and professionals) struggle with design principles. It is easy to put design on the back burner when working on an animated sequence that takes a great deal of technical effort. Yet all the greatest animation techniques in the world will not save a bad design. A bad design leads to poor communication of the message. And let's face it: every medium is about design. It's all about how you compose a page or screen or series of screens or any type of space with elements so people will look at and and draw meaning from it. 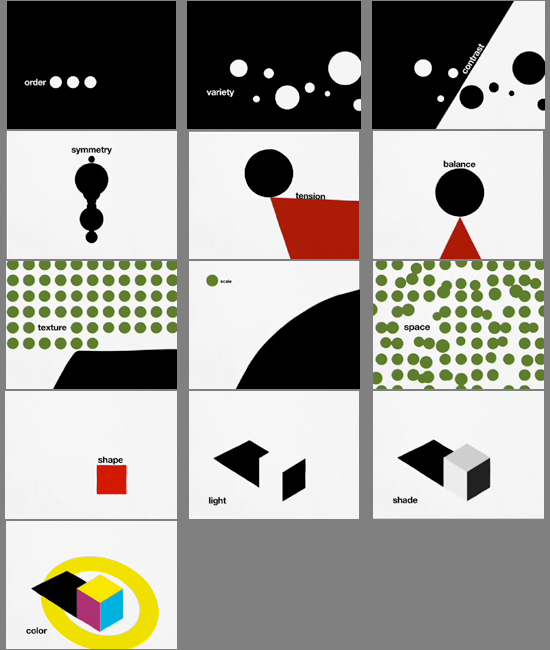 I try to utilize the "Language of Form" according to legendary designer Paul Rand in my work as well as encourage my students to do so. According to Mr. Rand, all design or art is the synthesis of Form and Content. So when creating a Form (or layout) to communicate a message, one must pay attention to the vocabulary of Form in order to create that synthesis. Order, Variety, Contrast, Symmetry, Tension, Balance, Scale, Texture, Space, Shape, Light, Shade and Color are the words of this vocabulary according to Mr. Rand. Check out this awesome piece created by Imaginary Forces that shows Mr. Rand talking about this subject while his designs animate to his narration. Promo that I recently designed and animated for Chicago Ideas Week for Bucktown Pictures. Design I created for a yoga mat using the vinyasa flow sun salutation A series of poses combined with visual representation of breath control. This assignment was to find an example of everyday vernacular and redesign it into a professional graphics system. The orginal vernacular was to be a handwritten, non computerized, sign that I had to redesign by hand. I took a picture of a sign that a homeless person on State Street was holding. I reworked it for better hierarchy and clarity using cardboard and markers. From here I had to redesign the entire communication into an graphics system. I expounded the cause to help all homeless people as opposed to this one woman. The system includes a website, poster and thank you card. Semiotic interpretation of the word "desire" with regards to material and sexual perspective. Image manipulation technique used. Photo by Getty Images. Purse by Louis Vuitton.My process using mind mapping and sketchesA big part of my research was going to the Gregg Bordowits's gallery lecture at the MCA regarding significant 1980's modern art. He discussed the role of desire with regard to soicetal influences which greatly influenced my piece. My digital paintings called Beautiful Pursuits were displayed at em.peace Gallery today! The paintings were sold to benefit the Ceases Fire organization that helps to end gang violence. I was so excited when I went on a visit to the MoMa recently and happened upon this awesome exhibit of influential typefaces of the 20th century. In this exhibit was Milton Glaser's original sketch and mechanicals for the I Love New York Logo that iconically branded New York since the late 1970's. I am sharing it with you now! Of course, I am struck by the simplicity and genius of his "napkin" exploration. But it is even more interesting to see his mechanicals that are now ancient technology with the advent of digital printing processes. AIA Signage from Patrick Osaji on Vimeo. My Advanced Motion Graphics Class at the Illinois Institute of Art created kinetic signage for the Architects Institute of America's Chicago office. The experience allowed them to go through the process of working with a client. They met with the Vice President of AIA-Chicago, Zurich Esposito, who gave them feedback regarding the goals and brand identity of the organization. The students worked with these guidelines to devise concepts in the form of storyboards and style frames. They reviewed their concept with the client who gave each student feedback. From there the students used motion graphics and digital filmmaking techniques to create their final pieces. Check out all the student pieces at the link below. AIA Chicago from Enrique Flores on Vimeo. AIA - Signage from Steven Greenwalt on Vimeo. Raven & Keila AIA FINAL from Keila Galvez on Vimeo. AIA Signage from DFH Productions on Vimeo. 5 Students Are Finalists In the CW Network Promo Competition! Steve Greenwalt's Making the Cut SubmissionCongrats to 5 of my students who are finalists in the BDA/Promax CW Network Making the Cut Competition! Steve Greenwalt, Cassandre Rivera, Matt Kirk, Fernando Mexicano, and Patrick Osaji had their work shown at the Promax/BDA Conference last month. The competition was to create a promo for one or more of the CW Netowork shows like Gossip Girl, 90210, Supernatural and Vampire Diaries. I assigned the project in my Broadcast Design class at the Illinois Institute of Art-Chicago. In the class, we worked on concept by researching the network show content and their target audiences. Then the students created pencil boards to flesh out concept and style frames to develop the visual flow of the piece. Finally they used their motion graphics and editing skills to create the final pieces. In at least one case, the student also shot footage. The students were invited to attend this year's BDA/Promax conference in LA where their work will be presented at a session devoted to this competition. Industry professionals from the networks and major design houses will be watching their work. I am so proud and happy for these students who really had fun with this project! CW PROMO from Steven Greenwalt on Vimeo. Become a Superfan from Matthew Kirk on Vimeo. Supernatural CW Promo from Fernando Mexicano on Vimeo. I had the honor of travelling to Rome to teach After Effects to the video department of the United Nations World Food Programme. The WFP is the world's largest humanitarian organization fighting hunger through out the world. The video department creates PSA's and video stories about the many hunger related issues in the world. Their work is seen on worldwide broadcast television and on the web. The group I worked with comprised of the head of the department, Jonathan Dumont, his videographer, a graphic designer and a photographer. Their main goal was to add more interesting typography work to their PSA's and video stories. No one in the group had worked with After Effects at all so my approach was to teach them all the basics in the three days we had together and then focus on working with typography on using their own footage. The three day session covered importing, keyframing, layering, layer editing, audio syncing and markers, parenting, nesting, shape creation, rendering, format issues, basic type creation and "textacy", effects, presets, track mattes, masking, and 3D layers, cameras and lights. Taking espresso breaks gave us much needed bursts of energy with such a rigorous curriculum. Since half of the group members had time based experience such as editing they caught on quickly. The other group members had significant Adobe experience so they understood how the program worked. It's like Photoshop in motion, I always say. The group picked up the text component of AE very well. The text component can be a bit of a challenge because the basis of the animation is on changing "range" parameters not transform values as is done in all the other animation techniques. Once they understood the concept they easily created detailed type treatments both from scratch and with the help of the text presets that they customized. Apart from the technical issues of animating type, we also discussed basic typography "rules" for broadcast such as avoiding thin line weights and very small sizes. Good typography practices such as how to choose appropriate typefaces, type crimes (stacking type, stretching out of proportion) and adjusting kerning and leading were topics of discussion. At the end of their session they felt confident that they will incorporate not only the text features of AE into their work but also masking, effects, and 3D. As the session was going on, Jonathan was juggling calls regarding upcoming shoots with various celebrities who volunteer their time for WFP's causes as well as travel plans to third world countries for more content coverage. It is very rewarding to see that the concepts I taught will be utilized in the work of this very significant humanitarian organization.